Those moments when a woman believes she might be pregnant can be full of anxiety, excitement and/or stress. And if she faces an unplanned pregnancy, those emotions are amplified. If a woman thinks she may be pregnant, we always recommend that she take a pregnancy test at home or come into CAPS for a nurse-verified free pregnancy test. While not every woman’s body is the same, most women experience the same early indications of pregnancy. These are the five signs of pregnancy a woman should consider before she begins to stress. The most obvious sign of pregnancy is a missed period. If a woman has a missed period for more than five days, which can also be considered a late period, that’s usually a strong indicator that she may be pregnant. However, there are many reasons a woman could miss or even skip her period. Making lifestyle or diet changes, starting a new exercise program, traveling, and undergoing stress can all affect a woman’s cycle. So although a missed period can indicate a pregnancy, it’s not necessarily the ultimate sign that a woman is indeed pregnant. Before she even realizes she’s missed a period, a woman might experience tenderness in her breasts. Her chest can feel sore and sensitive for anywhere from one to three weeks after conceiving. But while it’s one of the first signs of pregnancy, it’s not something every woman experiences. Nausea can range from a mild queasiness to vomiting and may happen at a certain time of day or off and on throughout the day. This symptom may reveal itself approximately five to six weeks after a woman’s last menstrual period. This nausea can last throughout her first trimester and usually resolves around 12 to 14 weeks. Because nausea won’t start affecting a woman immediately, it’s something to look out for once you’ve already missed your period. A woman may also feel fatigued during her first trimester. Almost as soon as she becomes pregnant, a woman be may start to feel sleepy and exhausted. This is because your body and hormones begin to change in order to deliver nutrients to your growing baby. 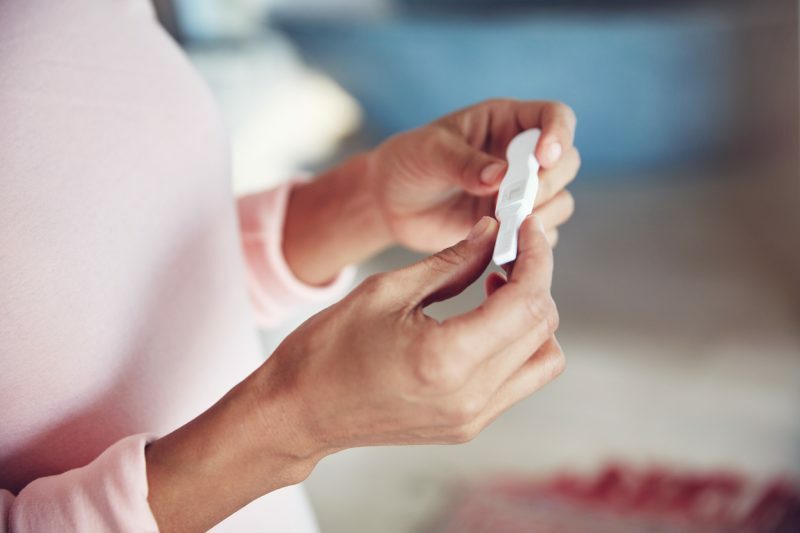 A positive pregnancy test may seem like the definitive answer to whether or not a woman is pregnant, but it’s not always the case. The majority of the time, a positive pregnancy test is the most reliable sign besides an ultrasound. A pregnancy test may also read positive when a woman is miscarrying. During miscarriage, the pregnancy hormones can still remain in a woman’s urine for a couple weeks even after she’s miscarried. This is why we recommend women come into CAPS once they take a pregnancy test at home and the result is positive. Here, the nurse can perform the pregnancy test and if positive, offer an ultrasound. The ultrasound will: verify an intrauterine pregnancy (rule out an ectopic pregnancy or miscarriage), measure the baby, give an approximate due date, confirm cardiac activity, and provide ultrasound pictures to take home. It’s important to remember that just because a woman is experiencing one of these symptoms, it does not mean she is definitely pregnant. Women have different hormone levels and different experiences, so these signs are not always accurate. The most definitive way for a woman to know she’s pregnant is through an ultrasound. At CAPS, we work with women of all ages and stages in life to not only confirm or determine if they’re pregnant, but also provide compassionate support to help them make an educated decision regarding the pregnancy. If you are experiencing any of these early signs of pregnancy, make an appointment online or call us at 619-337-8080 to schedule an appointment at one of our three locations in Downtown San Diego, SDSU College area, or Pacific Beach. All visits are free and confidential.